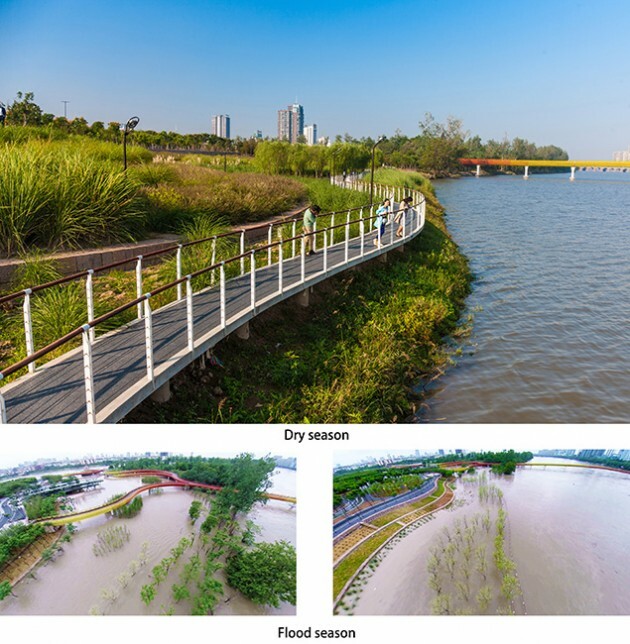 Turenscape: Water resilient terrain and plantings are designed to adapt to the monsoon floods; A resilient bridge and paths system are designed to adapt to the dynamic water currents and people flows. The bridge and paths connect the city with nature and connect the past to the future; Resilient spaces are created to fulfill the need for temporary, intensive use by the audience from the opera house, yet are adaptable for daily use by people seeking intimate and shaded spaces. The river currents, the flow of people, and the gravity of objects are all woven together to form a dynamic concord (Figure 01). This is achieved through the meandering vegetated terraces, curvilinear paths, a serpentine bridge, circular bio-swales and planting beds, and curved benches. The project has given the city a new identity and is now acclaimed as its most poetic landscape. 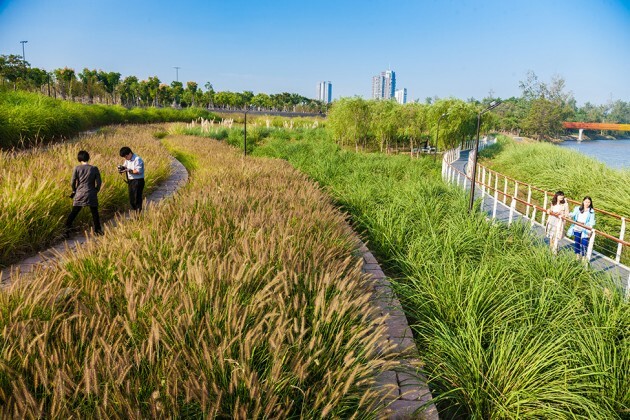 In the urban heart of Jinhua, a city with a population of over one million, one last piece of natural riparian wetland of more than 64.acres (26 ha) remains undeveloped. Located where the Wuyi River and Yiwu River converge to form Jinhua River, this wetland (Figure 02) is called Yanweizhou, literally meaning “the sparrow tail”. Beyond this tail, riparian wetlands have already been eliminated by the construction of an organically shaped opera house. Before the Yanweizhou Park project was implemented, the three rivers, each of which is over 100 meters wide, divided the densely populated communities in the region. As a result of this inaccessibility, the cultural facilities, including the opera house and the green spaces adjacent to the Yanweizhou were underutilized. The remaining 50-acre (20 ha) riparian wetland was fragmented or destroyed by sand quarries (Figure 02). The existing wetland is covered with secondary growth dominated by poplar trees (Populus Canadensis) and Chinese Wingnut (Pterocarya stenoptera) that provide habitat for native birds like egrets. 1) How can the remaining patch of riparian habitat be preserved while providing amenities to the residents of the dense urban center? 2) What approach to flood control should be used (prevention with a high, concrete retaining wall or cooperation by allowing the park to flood)? 3) How can the existing organically shaped building be integrated into the surrounding environment to create a cohesive landscape that provides a unique experience for visitors? 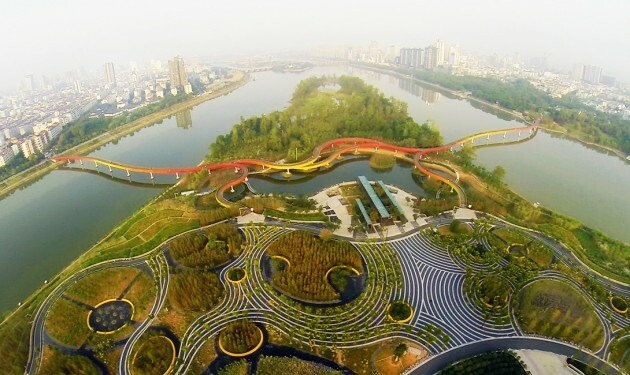 4) Finally, and most importantly, how can the separated city districts be connected to the natural riparian landscape to strengthen the community and cultural identity of the city of Jinhua? The first adaptive strategy was to make full use of the existing riparian sand quarries with minimum intervention. In this way, the existing micro-terrain and natural vegetation are preserved, allowing diverse habitats to evolve through time. The biodiversity of the area was adapted and enhanced through the addition of native wetland species. This enrichment, particularly of species that provide food for birds and other wildlife, increases biodiversity. Due to its monsoon climate, Jinhua suffers from annual flooding. For a long time, the strategy to control flooding was to build stronger and taller concrete floodwalls to yield cheap land for urban development. These walls along the riverbanks and riparian flood plains severed the intimate relationship between the city, the vegetation, and the water, while ultimately exacerbating the destructive force of the annual floods. 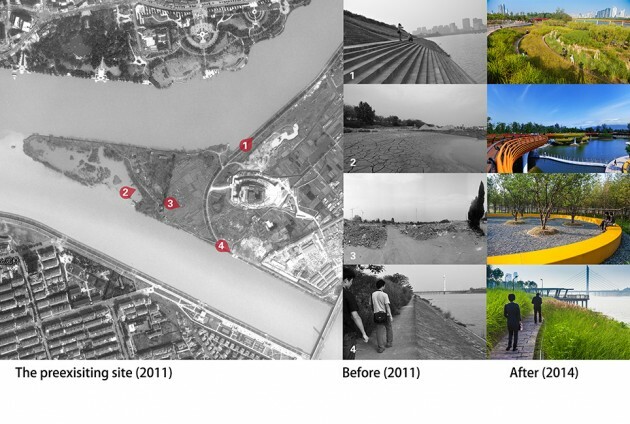 Following this formula, hard high walls have been built (Figure 02), or were planned to be built, to protect the last patch of riparian wetland (Yanweizhou) from the 20-year and 50-year floods. These floodwalls would create dry parkland above the water, but destroy the lush and dynamic wetland ecosystem. Therefore, the landscape architect devised a contrasting solution, and convinced the city authority to stop the construction of the concrete floodwall and to demolish others. 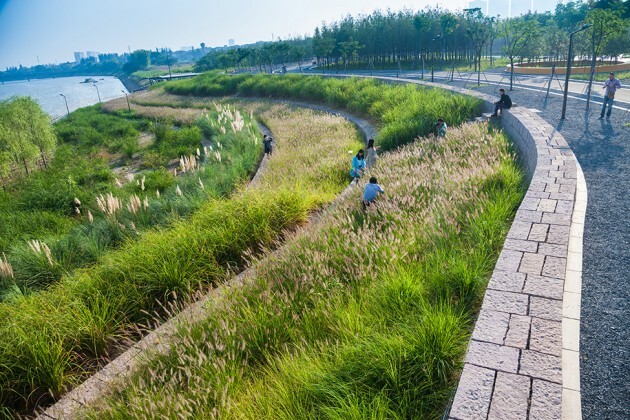 Instead, the Yanweizhou project “makes friends” with flooding by using a cut-and-fill strategy to balance earthwork and by creating a water-resilient terraced river embankment (Figure 03) that is covered with flood adapted native vegetation. Floodable pedestrian paths (Figure 11) and pavilions are integrated with the planting terraces (Figure 10), which will be closed to the public during the short period of flooding. The floods bring fertile silt that is deposited over the terraces (Figure 05) and enrich the growing condition for the tall grasses (Figure 12) that are native to the riparian habitat. Therefore, no irrigation or fertilization is required at any time of the year. The terraced embankment will also remediate and filtrate the storm water from the pavement above. 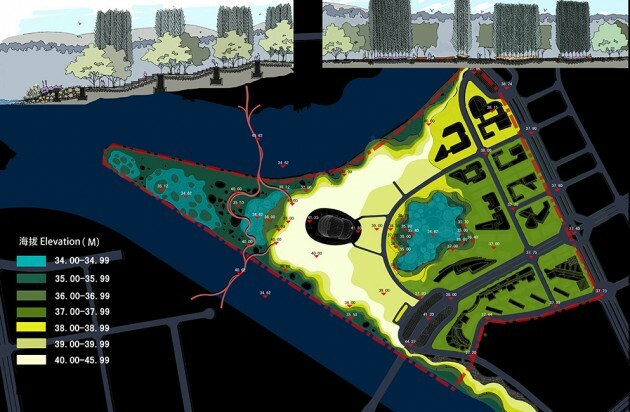 Although the design and strategies employed address only a small section compared to the hundreds of kilometers of river embankment, the Yanweizhou Park project showcases a replicable and resilient ecological solution to large-scale flood management (Figure 05). In addition to the terraced river embankment, the inland area is entirely permeable in order to create a water resilient landscape through the extensive use of gravel that is re-used material from the site (Figure 14). The gravel is used for the pedestrian areas, the circular bio-swales are integrated with tree planters (Figure 15), and permeable concrete pavement is used for vehicular access routes and parking lots. The inner pond on the inland is designed to encourage river water to infiltrate through gravel layers (Figure 06). This mechanically and biologically improves the water quality to make the water swimmable. 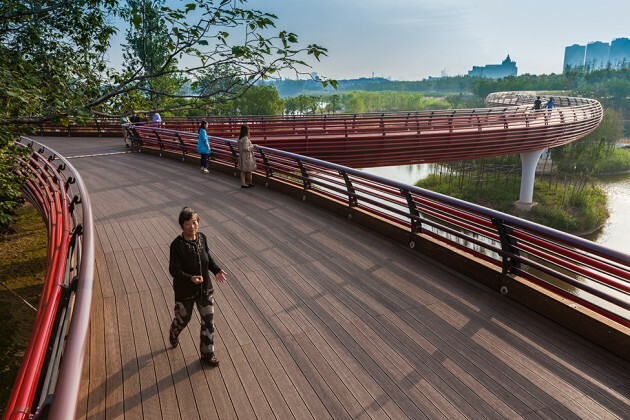 A pedestrian bridge snakes across the two rivers, linking the parks along the riverbanks in both the southern and northern city districts, and connecting the city with the newly constructed Yanweizhou Park within the river (Figure 01 and 08). The bridge design was inspired by the local tradition of dragon dancing during the Spring Festival. For this celebration many families bind their wooden benches together to create a long and colorful dragon that winds through the fields and along narrow dirt paths. Musicians sound gongs and beat drums, to the accompaniment of singing, dancing and yelling by villagers, young and old. The Bench Dragon is flexible in length and form as people join or leave the celebration. The dragon bends and twists according to the force of human flow. Like the bench dragon in the annual celebration the “Bench Dragon Bridge” symbolizes not only a form of celebration practiced in Jinhua area, but is a bond that strengthens a cultural and social identity that is unique to this area (Figure 07). As water-resilient infrastructure, the new bridge is elevated above the 200-year flood level, while the ramps connecting the riparian wetland park can be submerged during the 20-year and larger floods. Floodwaters cover the park for a very short period of time. 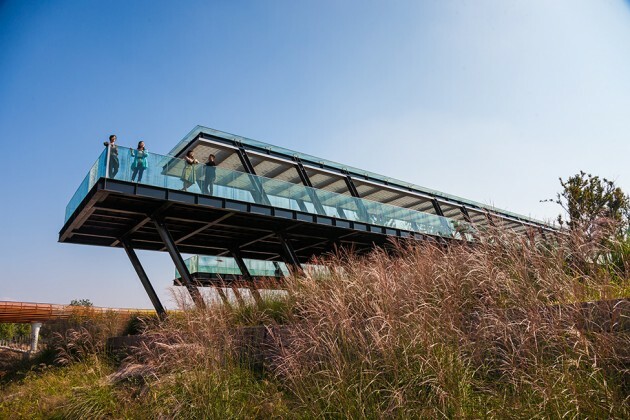 The bridge also hovers above the preserved patch of riparian wetland and allows visitors an intimate connection to nature within the city. The many ramps to the bridge create flexible and easy access for residents from various locations of the city in adaptation to the flow of people. The landscape architect designed the bridge to reinforce the festive, vernacular tradition, but also as an art form with a bold and colorful combination of bright red and yellow tones (Figure 09) that are strengthened by night lighting. All together 2,300’ (700 m) long, the bridge is composed of a steel structure with fiberglass handrails and bamboo paving. The main bridge is five meters wide, with four-meter wide ramps (Figure 08). This bridge is officially named Bayong Bridge (Bridge of Eight Chants), after eight famous poems written in ancient times about landscapes surrounding the site. It is truly a resilient bridge that is adaptive to river currents and the flows of people while binding city and nature, future and past. The large oval opera house (designed by the Zhejiang Architecture Institute) posed significant challenges for the landscape architect. First the building shape tends to repel rather than embrace the user and landscape (Figure 01). Therefore, the first challenge was devising innovative forms that would welcome and embrace the visitor. Secondly, the area near the building needed to accommodate the large opera audience as well as the need for intimate spaces and ample shade. Finally, the designers were challenged with the problem of how to integrate the singular flood-proof big object into the floodable, riparian waterfront. The design uses curves as the basic language, including the curvilinear bridge, terraces and planting beds, concentric paving bands of black and white, and meandering paths that define circular and oval planting areas and activity spaces. The spatial organization and design forms establish an extensive paved area for a large audience during the events at the opera house. However, the forms and the inclusion of alcoves create places for the individual, couples and small groups (Figure 04). 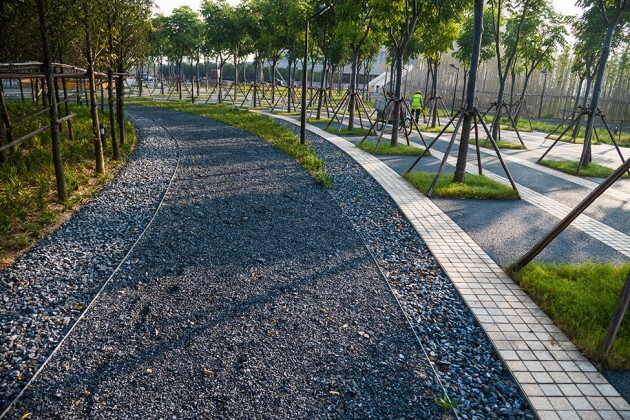 The dynamic ground of the pavement and planting patterns define circular bio-swales and planting beds, densely planted with native trees and bamboo, bound by long benches made of fiberglass (Figure 15). The circular bio-swales and planting patches resemble raindrop ripples on the river (Figure 04). These curves and circles are the unifying pattern language that integrates the building and the environment into a harmonious whole. The reverse curves simultaneously refer to the shape and scale of the building while forming a contrasting shape that is human in scale and enclosed for more intimate gatherings. They also reflect the weaving of the dynamic fluxes of currents, people and material objects that together create a lively pleasant and functional space. The project is a proven success. After the park opened in May 2014, an average of 40,000 visitors used the park and the bridge each day. 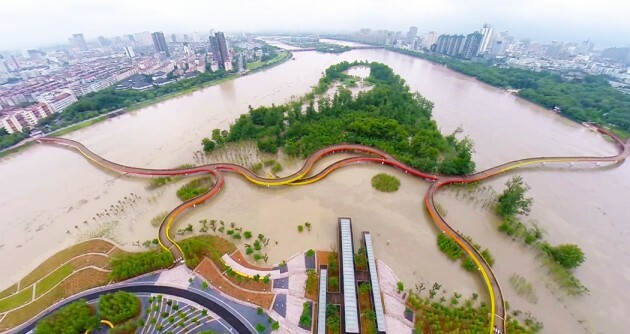 The local media exclaimed: “the whole city is crazy about one single bridge!” And now, the Yanweizhou Park has created a new identity for the city of Jinhua. Figure 02. Pre-existing Conditions (before) and Transformations (after). The existing site was a riparian wetland ruined by sand quarry and concrete floodwalls. 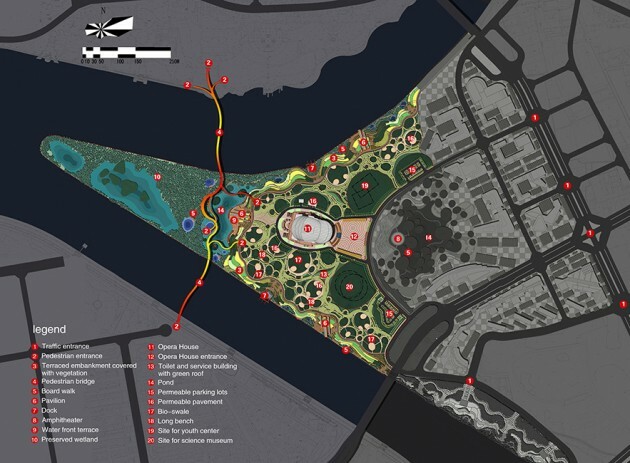 The resilient design strategy dramatically transformed the site through the design of an eco-friendly embankment, making the site accessible and connecting the segregated city. Figure 03. Grading Plan and Section: Flood walls are removed and a cut and fill strategy is used to create terraces to make the site cooperate with flooding. The design is 100% permeable. The surfaces include gravel surfaces for pedestrians, bio-swales for planting, and permeable concrete for automobile use. Figure 04. An aerial view of the park during the dry season, note the lush tall grasses covering the terraces on the embankment. The terraces are enriched by silt deposited during the flood season (view is toward the west, photo: November, 2014). Figure 05. An aerial view of the park during the monsoon season showing a 20-year flood and testifying to the flood resilient design. Note the uninterrupted connection of the city through the bridge (the view is toward the west, photo: May, 2014). Figure 06. The inner pond on the inland is designed to allow water to infiltrate from the river through the gravel layers that make the otherwise dirty river water swimmable (kids playing in the pond, summer, 2014). Figure 07. Inspired by the vernacular Bench Dragon Dancing, the iconic Bayong Qiao bridge is more than a connecting infrastructure. It attracts thousands of residents and tourists, and over forty thousand people visit the bridges daily. It recovers the vernacular cultural identity of the city (early morning scene, 2014). Figure 08. 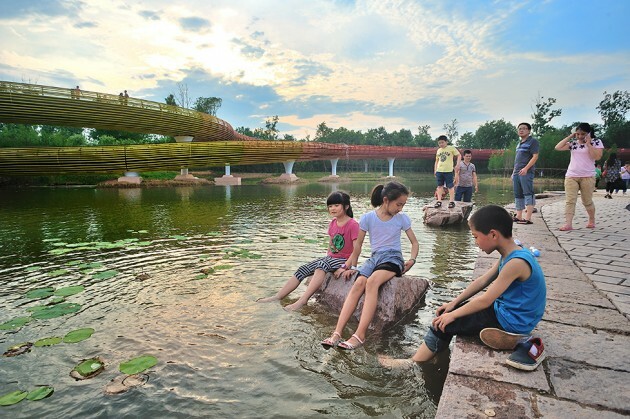 The Bayong Qiao bridge flys above the former sand quarry and connects the city with nature. The former sand quarry has been transformed into a pleasant park that allows people to have intimate contact with the remnant patch of the wetland forest. Figure 09. With multiple ramps aligned to the flow of people, the Bayong Qiao bridge is more than a physical link. 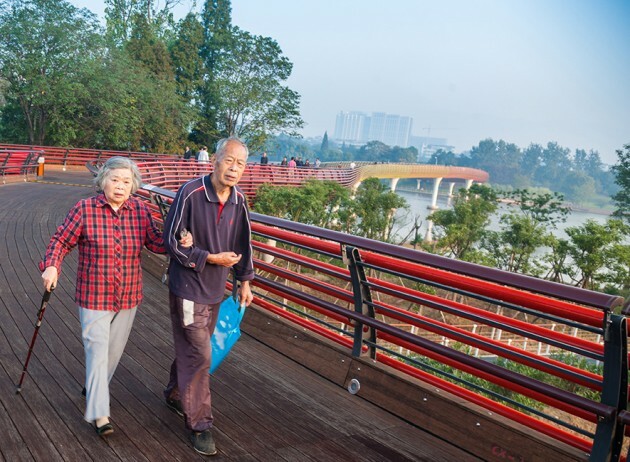 It is a social connection that helps to build the community by creating a gathering space for families and residents who walk, jog and chat together on the bridge. Figure 10. The beautiful terraced embankment was built by removing the concrete floodwall and through a cut-and-fill strategy that balances the earthwork on-site. The terraces create a flood resilient zone that allows people to enjoy the lush tall grasses adaptive to the seasonal floods (view toward the northwest). Figure 11. The flood-adapted boardwalk integrates the path system with the terraces. This path affords visitors an intimate naturalistic experience over the riparian vegetation. The elevated boardwalk is just above the five-year flood level (view is toward the southwest). Figure 12. The terraced embankment in flood resilient zone is accessible through stairs and paths along the top of terrace walls for emersion within the varied texture, color and movement of the lovely grass panels (view is toward the east). Figure 13. This pavilion provides a dramatic viewpoint as it extends above the 200-year flood level. The pavilion features a detailed view of the pond water feature and expansive views of the river, the city and the Bayong Qiao bridge. Figure 14. The surface of the inland area is hundred percent permeable. Generated from on-site materials, gravel is recycled to create pedestrian surfaces. Gravel surfaces alternate with unit pavers and permeable concrete to create a distinctive pattern. Bio-swales are integrated with tree planters, and permeable concrete pavement is used for automobile routes traffic use and parking lots. Figure 15. Circular spaces punctuate the extensive paved area needed when the opera house is in use and provide intimate shaded spaces for daily use. 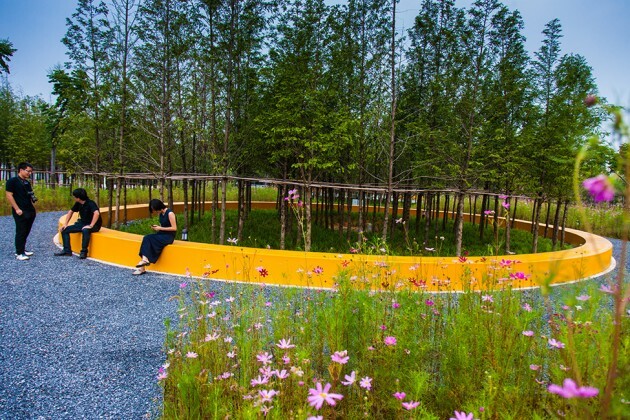 Long fiberglass benches encircle the bio-swales planted with native water adapted species, such as Chinese Redwood.